and a registered medium at Lily Dale, New York, the world's largest center for the religion of Spiritualism. A 5th generation Spiritualist, Gretchen lives in Lily Dale, offering hope and comfort to those who have sought her counsel since 1976. Internationally known as a medium, lecturer and workshop leader, Gretchen Clark has been heard on radio and seen on television. Most recently, Gretchen was photographed by Shannon Taggart for "Discover the Tiny Town That Sees Ghosts All Year Round." For 15 years Shannon Taggart has been photographing the home of Spiritualism. Gretchen was featured in HBO's "No One Dies In Lily Dale" (July 2010). Gretchen has been interviewed by many publications, including: People Magazine, New York Times, Dallas Times and the Los Angeles Times. She has done numerous radio shows such as N.P.R. 's "Savvy Traveler", television shows on the Discovery channel, N.B.C. 's "Strange Universe", A & E's "Mediums: We See Dead People" and The Canadian Vision channel. She has lectured for the Learning Annex from Manhattan to Los Angeles and Toronto. She offers workshops and classes on mediumship development and other topics. She has also recently released a video "Where Do We Go From Here" that answers what happens when we die, how and why spirits communicate with us, and gives pointers on developing your own ability to hear and see spirit. 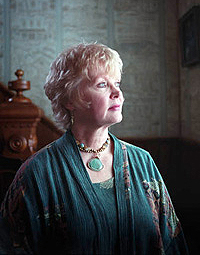 Gretchen Clark is a 5th generation Spiritualist who was born a medium. She has a deep background and understanding of what she perceives. She has been a registered medium at Lily Dale since 1976. Gretchen is also a Reiki master and Spiritualist healer. Gretchen Clark has several new workshops and videos available.